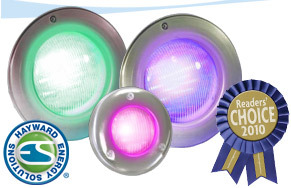 Add the beauty and atmosphere of underwater lighting to your above ground or inground pool. It will make your evening swims a more beautiful and satisfying experience. ColorLogic 4.0 starts with five fixed colors that can be enhanced with seven color-changing shows. Integrate it with Pro Logic’s Network Module, and you get four additional shows with adjustable speed, motion and brightness control and a brilliant spectrum of 101 adjustable colors. It is a color palette and synchronization that is as unequaled as it is inspiring. Advanced, patented hydro-optic technology produces more light with less energy than others—you light your entire pool affordably. 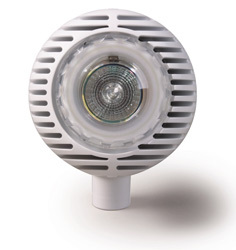 The energy-efficient halogen quartz light has a rated life of 4,000 hours to deliver maximum value. No expensive wiring is required. Just plug into a normal outlet. Comes with two color lenses to create just the right mood for your evening swims. Adding AquaLuminator to your pool is truly “Plug ‘n Play”. You get the brilliance of underwater lighting in just minutes, for lasting pool beauty and enjoyment.